The Lightning clinched the Presidents' Trophy and home-ice advantage throughout the playoffs with nine games left in the regular season. With no blueprint for how to play hockey games that don't matter, they're glad that eight of their final nine games come against teams currently in playoff position and turning this into a dress rehearsal for what could be a long run. "It helps with the teams that we have left on the schedule," forward Adam Erne said. "They're all going to be playoff-like games, and I think we have a playoff mentality and we know that we can't just flip a switch once playoffs start. We want to prepare ourselves for the first round." Tampa Bay is already 2-1-0 since clinching, faces Boston on Monday and in the season finale and has games left against Washington, Montreal and Toronto. There's very little of the unpredictability of what to expect from opponents playing out the string — save for a game at cellar-dwelling Ottawa — and plenty of meaningful games to keep the Lightning from getting complacent. This is the first Presidents' Trophy in Lightning history, so when he was asked how to handle clinching so early, coach Jon Cooper quipped, "I guess we're going to find that out." Cooper already should be in contention for the Jack Adams Award as coach of the year, but he shouldn't have to do too much motivating considering the Canadiens, Bruins or Maple Leafs and Capitals could reasonably make up his team's path to the Stanley Cup Final. "A lot of times the opponent brings it out in you," Cooper said. "A lot of these teams will pull the best out of you, and we've just got to be ready for it." Captain Steven Stamkos acknowledged it's impossible to replicate playoff emotion in the regular season but said "there's still some things that we want to accomplish." MVP candidate Nikita Kucherov should finish first in points by a lot, but he's also seven shy of Alexander Mogilny's single-season record for a Russian player. Countryman Andrei Vasilevskiy leads the league in victories by a goaltender and is also making a case to win the first Vezina Trophy of his career. There's a lot of guys having great seasons individually and as a team we're having a great season," defenceman Ryan McDonagh said. "We want to see how well we can finish, too, and there's a lot of pride in that. ... Collectively as a team I think we've set ourselves up obviously for a great opportunity and we're trying to understand that and really just try and gain some confidence here." More than anything, the Lightning don't want to lose a step that could be costly in the playoffs. 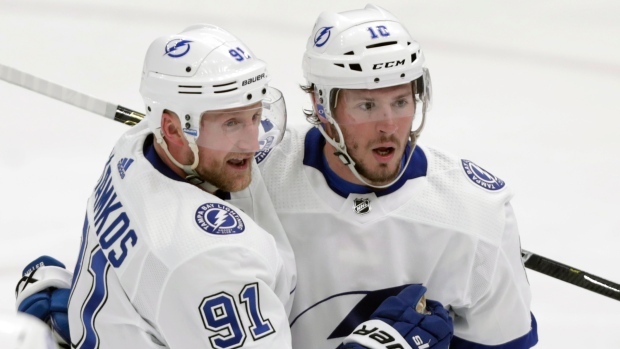 Cooper is unsure if he'll rest any players down the stretch, and Stamkos doesn't expect that at least until the final couple of games. The fact that most of these games will matter to opponents could affect Cooper's decisions, too. But he and Tampa Bay's focus is on getting 16 victories to win the franchise's first title since 2004 and there doesn't seem to be any lack of focus on that end goal with six games left in the regular season. "You want to make sure that you're not giving any gimme games while you're trying to rev up your engine again for the playoffs," defenceman Braydon Coburn said. "You don't want to be the team that's limping in the playoffs just because you had a good record."